Many scientists say that maths transcends creation, the future, it exists for all time. 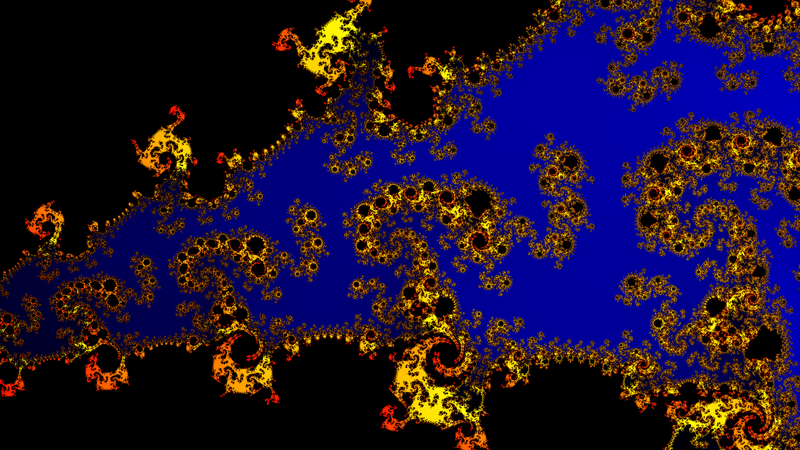 For example the Mandelbrot is just an equation that can still exist when the universe goes cold. Because I don't like unsolvable mysteries, I have decided that the Mandelbrot is similar to the Universe, spirals, black holes, points of light, infinite size. and both can exist independently and are just a mathematics formula. How can I research the logic of that theory? What do I need to know? Mathematics is a study. That requires an agent. [Mathematics] has no generally accepted definition. ...and goes on to link to Definitions of mathematics. Aristotle defined mathematics as: The science of quantity. Science is both a method, and activities that adhere to this method. If no-one is acting by the method or has defined it, no, then it does not exist. So in general Mathematics is not a thing on its own but is used to describe certain types of activities undertaken by agents. But you said there is no universe. This means there are no agents. If there is no-one around to perform any activity, there can be not be anything like mathematics. So if we go by these definition, then the answer is no, there would not be mathematics because mathematics is a study. If you have no-one to do the study, the study does not exist. The idea that mathematical objects exists independently of the material world is called Mathematical Platonism, which is a form of Mathematical Realism. What are the sources of mathematical subject matter? What is the ontological status of mathematical entities? What does it mean to refer to a mathematical object? What is the character of a mathematical proposition? What kinds of inquiry play a role in mathematics? What are the objectives of mathematical inquiry? What gives mathematics its hold on experience? What is the source and nature of mathematical truth? And most relevant to your question: What is the relationship between the abstract world of mathematics and the material universe? Objective realities exist because certain things affect your consciousness and mine in the same way, but we are assuming something we have no right to assume if we label them as either "real" or "ideal." The true label is, I think, "mathematical," if we can agree that this is to connote the whole pure thought, and not merely the studies of the professional mathematician. Such a label does not imply anything as to what things are in their ultimate essence, but merely something as to how they behave. We go beyond mathematical formula at our own risk; we may find a model or picture which helps us to understand it, but we have no right to expect this, and our failure to find a model or picture need not indicate that either our reasoning or our knowledge is at fault. The making of models or pictures to explain mathematical formulae and the phenomena they describe is not a step towards, but a step away from reality; it is like making graven images of a spirit. And it is as unreasonable to expect these various models to be consistent with one another as it would be to expect all the statues of Hermes, representing the god in all his varies activities--as messenger, herald, musician, thief, and so on--to look alike...All the same, some mathematical physicists are still busily making graven images of the concepts of wave mechanics. In brief, a mathematical formulae can never tell us what a thing is, but only how it behaves; it can only specify an object through its properties, and these are unlikely to coincide in toto with the properties of any single macroscopic object of everyday life. Mathematical formulae are only the means for us to understand and describe the phenomena that are common to our common sensual perceptions. Our innermost being 'x' is perceiving the universe through our mind and senses. What we are perceiving outside we can say is 'y'. But exactly "what" 'x' and 'y' are we cannot say. Mathematics, IMHO, is not absolute. Before today at might have answered with the opposing views, but today I decided that math, like time and space, must be relative. Even if you decide to derive all of your mathematics and arithmetic directly from set theory (or especially if...), Then the very idea of a number is in relation to a set. A set of things (or sets, or empty sets, or whatever). If that argument doesn't hold any weight, then how about hypotenuse of a square with sides of 1 unit? Is the answer irrational? Depends on how you define the unit, now doesn't it? One man's 1 unit is another's 2 units. If the sides are 2 units in length, the results are quite different. The sides of the square are the same "true" length in both examples. So, for the reasons above and for many more not listed, I must conclude that no such unicorn exists. Math cannot exist in isolation. Even logic, arguably more fundamental than math, is powerless without it's Ps and Qs and could not exist without the aforementioned symbolic representations. Not the answer you're looking for? Browse other questions tagged metaphysics philosophy-of-mathematics existence universe or ask your own question. If the universe doesn't exist, can mind still exist?